THE KARSTOGRAPHY OF THE DINARIC KARST IN BOSNIA AND HERCEGOVINA. - the principal Austrian Karst Engineer employed by the Austro-Hungarian Monarchy to work in Bosnia and Hercegovina. updated on 05 January 2011. ..........1.0...General Introduction to the EU Protectorate R. Bosnia & Hercegovina. ..........2.0...General Approach to Presenting a Detailed Karstography of Bosnia & Hercegovina. ..........5.0...Index of Links to the Karstography of the Dinaric Karst in BiH. ..........6.0...Bibliography, References and Further Reading. ..........Use the sub-Headings 2.0. to 6.0. above as Links to the text sections below.
. 1.0. GENERAL HISTORICAL INTRODUCTION TO THE EU PROTECTORATE REPUBLIC OF BOSNIA AND HERCEGOVINA. In common with almost all independent Sovereign States in Europe, the present territorial area of the Republic of Bosnia & Hercegovina is the result of a tumultuous and turbulent history, and particularly so in this case. The country's history for the past 1000 years has been one of constant invasion or re-invasion by the peoples of surrounding countries or by the imperial armies of distant empires. From the time of the Roman Empire, the territory has been variously occupied, annexed, traded, invaded, liberated, expanded or reduced in size. A synopsis of the difficult history of this region can be seen in the separate Link Page. Synopsis of the History of the past 1000 years. Importantly, the Country has survived to be able to present its current territorial area of a spectacular 51,129 km² (19,741 sq miles), to the world. It retains a small coastline of 21.2 km in length, linking it directly to the Adriatic Sea. Unfortunately, as far as we are aware, the small coastline does not automatically give BiH a direct and independent access to international waters. Under the Terms of the Dayton Agreement, this is currently under review and a rationale to give BiH control of direct access to the International Waters of the Adriatic Sea have been agreed in principle. It will indicate the extent of land-area losses in the intervening period between then and now, insofar as some of the former territory of Hercegovina of 100 years ago is now contained within R. Montenegro and R. Croatia. In common with the usual practise in Bosnia & Hercegovina, we shall often use the initials "BiH" in the text to represent the abbreviated name of the Republic. The Dinaric Alps or Dinarides are a mountain chain in Austria, Slovenia, Croatia, Bosnia & Hercegovina, Serbia, Montenegro and Albania. They extend from the Julian Alps in the northwest down to the Šar-Pindus Massif in the southeast. The word "Dinaric" is derived from the Mount Dinara Massif, situated on the border between Bosnia and Croatia. The two geological maps below illustrate the position of the Dinarides within the greater European context. Structurally, the Dinaric Karst has a strike trending in a northwest - southeast direction. This structural pre-disposition is visually reflected in the directional trend of one of the region's most well-known type of physical characteristics - that of its karst polja. Indeed, the Dinaric Karst possesses the highest concentration of karst polje development. Bosnia & Hercegovina has its only sea port of Neum in Eastern Hercegovina. Under the current arrangement of international borders, created when the F.S.R. Jugoslavia came into being, Bosnia and Hercegovina has had its coastline along the Adriatic Sea reduced to only 25km (15 miles) in length. The MAP Office in Bosnia and Hercegovina has made a proposal for projects considering a Strategic Action Programme to address pollution from land-based activities. Projects are divided in three groups - hot spots, sensitive areas and critical habitats and ecosystems and endangered species. (i) Sewerage system and waste-water treatment plant in the town of Mostar; (ii).Reclamation of the red sludge disposal of the aluminium factory in Mostar; (iii).The Neum-Klek Gulf Project. (i) Program for investigation works on water quality protection in the region of Bosansko Grahovo town; (ii).Solid municipal waste dumping site effects on water quality in Adriatic Sea basin; (iii).Channel Mali Ston and Neum-Klek Gulf. (i) Protection of biological diversity and ecosystem of Neretva river delta; (ii).Management and protection of ecological and biological diversity of the Neretva river canyon. We note that these issues are confined to the BiH-Federation Territory. We hope to see this extended into the BiH-RS Territory and we await practical developments on the karst. using a modern observational perspective combined with an historical archival retrospective : . In attempting to realize our aim of presenting dedicated webpages for The Karstography of the Dinaric Karst in Bosnia and Hercegovina, we are faced with a potentially daunting task of a complex and lengthy nature. Any attempt at describing the physical geography of one of the most famous and impressive classical karst areas of the World has to have a systematic basis or structure or it will falter and never materialise. Our attempt is systematic and structured. It will take a considerable period of time to develop to a stage where we can clearly state that it is a useful educational and research reference tool. Our aim can never be "completed" in any sense of the word, because the very nature of a karst environment is dynamic. When this natural dynamism is combined with the anthropogenic changes constantly being inflicted upon the Dinaric Karst by engineering projects, we can only hope to keep abreast of the changes and report upon their effects. With the momentous political changes in the Balkans of the last decade of the 20th Century with the resultant creation and emergence of totally independent Nation States, this part of Europe is undergoing massive socio-economic and political restructuring, which will continue into the foreseeable future. Inevitably, this will have a marked and long-lasting impact on the natural karst environment, as industry develops and the associated needs for natural resources increases. For Bosnia and Hercegovina, the second least industrially-developed country of the former Yugoslavia, this impact will be seen and felt more so than in neighbouring Sovereign States. secondly, during the period of the Federal Republic of Yugoslavia,.when many of the earlier Austro-Hungarian karst development plans were enlarged upon and then implemented and furthermore, when even more technically-ambitious karst engineering plans were developed and partly realized. Philipp BALLIF (1847-1905) - the principal Austrian Karst Engineer employed by the Austro-Hungarian Monarchy to work in Bosnia and Hercegovina as Surveyor of Works to the "Sovereign Government of Bosnia and the Herzegovina". -..Founder of the BiH Meteorological Service at Avtovac, Gatačko Polje; Alfred GRUND (1875-1914) - the Czech speleologist and karstologist. Th. SCHENKEL - an Austrian Karst Engineer employed by the Austro-Hungarian Monarchy to work in Bosnia and Hercegovina. ...Jovan CVIJIĆ (1865-1927).- the great Serbian Geographer, Academic, Ethnographer and Diplomat. - Graduated at the College of Natural Sciences and Mathematics, Beograd, 1888. - Post Graduate Doctoral Dissertation "Das Karstphänomen." - Founded the Serbian Geographic Institute, 1893. - Published "Karst (A Geographic Monograph)", 1895. - Appointed Professor of Physical Geography, Prague University, by the k.k. Ministerium für Kultur und Üntericht in Vienna, 1903., (but refused the offer). - Appointed Professor at Beograd University, 27 February 1905. - Founded the Serbian Geographic Society, Beograd, 1910. - Established the "Bulletin of the Serbian Geographic Society", 1912. - Initiative to Found the Speleological Section of the Serbian Geographic Society, 1924. - President of the Serbian Royal Academy of Sciences, 1921-1927. Hidroelektrane na Trebišnjici Co. Archives, Trebinje, BiH. HET Institut za Korištenje i Zaštitu Voda na Kršu, Trebinje, BiH. It is our opinion that this Institute should never have been closed down by the HET Company. There is a greater need for it now than ever before. Österreichisches Staatsarchiv - Kriegsarchiv, Wien, Austria. -..Information from the Royal and Imperial Agricultural Ministries, Vienna and Budapest. "Mittheilungen der Section für Höhlenkunde des Oesterreichischen Touristen-Club." The publication began with Issue No. 1., 01 April 1885., a critical time for recording the work of the Royal and Imperial Military-geographical Institutes in the Occupied Territories in Bosnia and Hercegovina. The archived documents of The Royal and Imperial Cave Investigations Detachment, based in Mostar, Western Hercegovina during the Austro-Hungarian Period of Administration of the Karst Territories, are also a source of much relevant information, which we shall draw upon in due course. The question as to the relevance (to the task in hand) of what this part of the Austro-Hungarian Army was all about can now be answered. A cursory glance at some of the postcards indicate "who" was "where" at particular times. The frank marks reveal that the "who" element comes up with particularly interesting and familiar names in Austrian Speleology and the rank that they held. For example, amongst other famous names in speleology, Oblt. Hermann Bock was a "Höhlenforscher des 5.A.E.K Corps" or Cave Researcher in the 5th Army Station Command Corps. It seems that cave researchers and karstologists everywhere and in all circumstances will always maximize the available opportunities to carry out their interests!! AND A VIEW OF THE FUTURE .... TODAY !! In many cases, where the natural karstography has not yet been changed by human interference but is under threat of being so, it is perhaps equally important that we record the situation prior to such changes being implemented. Can the Competent Authorities in Bosnia and Hercegovina learn from the failures of the past where karst-environmental degradation has occurred as a result many karst-environmental engineering projects? One possible view into the future can be seen by looking at the extant heritage of the decisions that were made in the past ..... tomorrow's past is here today!! Part 1. The Karst of Bosnia. Part 2. The Karst of Western Hercegovina. Part 3. The Karst of Eastern Hercegovina. Each PART is then subdivided into the specific karst area being described, which is undertaken mostly, though not exclusively, by Karst Polje. As explained above, the descriptions are based on both the Society's own experiences and that of others, so we will draw on old archive material as often as is necessary to augment the task. The Region of Montenegrin Hercegovina, (Old Hercegovina), formerly partly within the borders of Bosnia and Hercegovina when under the administration of Austro-Hungary, is contained within the geographical boundaries of the Society's "Proteus Project", as is also Croatian Dalmatia and Konavle. There are no long-term plans to produce web-pages considering the Dinaric Karst in Montenegro, Croatia, Serbia or Macedonia and there are no future plans for coverage of the Slovene Karst. The task of presenting an expanded and detailed Karstography will take many years to complete. The ideal aim would be to present descriptive text and imagery at least to the level of detail currently achieved with that in the FATNIČKO POLJE Webpages and indeed we have achieved near this level of study in our karstographic documentation of some other karst polja. However, in regard to the bulk of the locations on the lists below, this is impractical in the short to medium term future. Initially, the simple schema is to present a single XHTML document in which we are able to provide a common framework or presentational format of basic data for an increasing number of locations, whilst having regard to local sensitivities when considering whether or not to present information about specific locations. Where areas in our current task overlap with the activities of the Society's Main Project in BiH - The "Proteus.Project", the decision has already been taken not to republish Project-related information. During the progress of Project field-work within Hercegovina, we are incidentally recording and gathering information about all hypogean fauna encountered underground. It has been decided that this aspect of the work is now to be undertaken in greater detail and that it will no longer be "incidental" but as of July 2006., will become one of the automatic parallel objects of the exercise. We have such a unique opportunity to record for science the often very rare species, endemic to this country, that it cannot be wasted. As a result, a Systematic Hypogean Species Catalogue for Bosnia and Hercegovina is now being compiled, both as a research reference document and for future use in local education. During the progress of Project field-work within Hercegovina, we are incidentally recording and gathering information about both the surface fauna and flora. In light of the fact that we have been unable to source any definitive publication on these subjects, this work will continue, insofar as it will prove to be useful for the future development of the flora and fauna pages of the individual karst polja within our Web pages about the Karstography of the Dinaric Karst of Bosnia & Hercegovina. The UK Project Co-ordinator Group has allocated two individuals, Lynne and Alan Satterley, to undertake surface fauna and flora species identification where possible and to compile the data for possible future use. We are grateful for the investment of their valuable time and patience in the process of determining the identification of surface species. 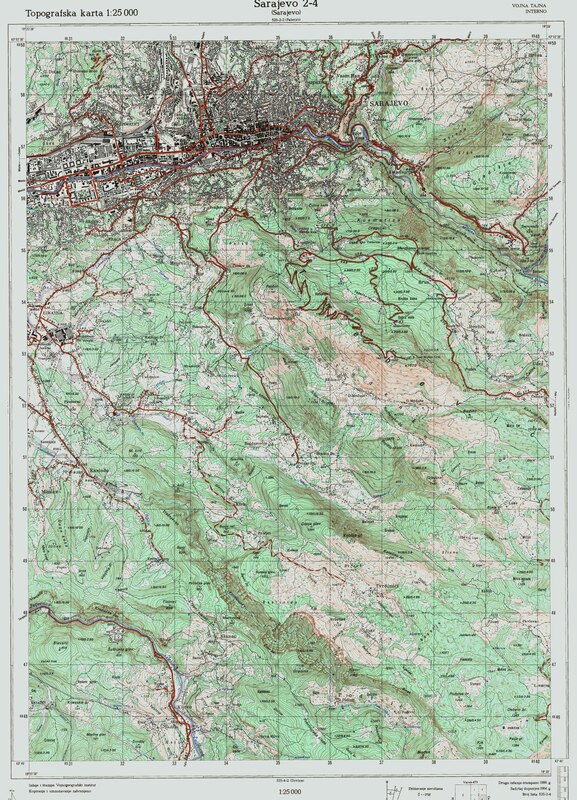 It should be noted that detailed topographic, geological and geomorphological maps are not generally available for Bosnia and Herzegovina. The most accurate and detailed maps are those produced during the period of Austro-Hungarian Administration. 1 : 50 000. This Series of maps can be obtained or viewed at a variety of locations within and beyond Bosnia and Hercegovina. For the purposes of karstological and speleological research, this scale of map is not generally useful. There are a few sets of the more useful 1 : 25 000 maps in circulation. (There is at least one set of the maps at this scale in private ownership in the UK). The whole of the country was covered by maps produced to scales of 1 : 10 000 and 1 : 5 000., but these were for use by the State Authorities only and were never released for general use. The Society does have copies of extremely highly detailed maps to these scales but only for certain karst areas or specific locations within Eastern Hercegovina. As of August 2006., we have acquired the FSRJ. 1 : 25 000 Scale Maps of all of BiH, including BiH Eastern Hercegovina and Croatian Dalmatian, which we shall be using as the base-maps where individual polje-related sections are published in these Webpages. As of August 2007., we have obtained the FSRJ 1 : 2 500 Scale Maps of parts of Eastern Hercegovina and as of August 2008, we have the whole of Bosnia & Hercegovina and Montenegrin Hercegovina covered to the scale of 1 : 25 000. Additionally, we are now obtaining Plan Sheets to the Scale 1 : 1 000 of those parts of Eastern Hercegovina relevant to our Project work. All these detailed scale maps and Plan Sheets are based on those originally produced by the Austro-Hungarian Administration. We provide a Link to a digitized 1 : 25 000 Scale Map (dated 1986) of the great and historic Capital City (and its environs) of all Bosnia & Hercegovina, Sarajevo - Sheet 525-2-4 Sarajevo. In conjunction with the topographic maps and Plan Sheets, we are increasingly using our library of the Official very high quality Air Photogrammetry Information. Where original accurate Geographic Locational Positioning References for karst or speleological sites are obtainable from any source, we will publish such data. Whether or not such data is available, we may be able to provide our own references using a GPS instrument. Where we have visited individual locations we will always have obtained a GPS Reference. We shall be using the format [Degrees, Minutes, Seconds, (Latitude) : Degrees, Minutes, Seconds, (Longitude)]. Wherever possible, this will be augmented with details of the Elevation (Altitude), presented as metres above sea level - [m. asl.]. .....- The BiH (Bosnjak and Bosnian-Croat) Federation political entity is the geographically larger of the two entities, administering 51% of the BiH Territory. .............For Governmental Administrative purposes, the BiH-F Territory is divided into CANTONS, which are sub-divided into MUNICIPALITIES. Its "Entity Parliament" is located in Sarajevo. .....- The remaining 49% of the BiH Territory is administered by the Bosnian-Serb Authorities, who have applied the self-styled name of "Republika Srpska" to their political entity. .............For Governmental Administrative purposes, the BiH-RS Territory is divided into REGIONS (currently a non-functional arrangement), which are sub-divided into MUNICIPALITIES. Its "Entity Parliament" is located in Banja Luka. Unfortunately, distinct KARSTOGRAPHICAL boundaries do not necessarily conveniently co-incide with POLITICAL or ADMINISTRATIVE boundaries, with the result that this can cause sudden unexpected practical problems on the ground when undertaking karst field-work without seeking prior appropriate access permission. An example area which exemplifies this situation more than any other is that of Popovo Polje, where unguided visitors, who may be unfamiliar with the area, are especially at risk when wandering off the main roads into the surrounding karst countryside. So, for the purpose of clarifying the location of areas described in the dedicated webpages, we have included their political / administrative locational references within the title-header of each webpage. We strongly recommend that anyone proposing to undertake a detailed visit to any of the areas described, seek prior permissions from both the head of the local Municipality and the relevant Speleological Organization before doing so. We also strongly recommend that the more sensitive areas bordering the inter-ethnic boundary should be completely avoided. what those problems are actually perceived to be. Then there is the additional problem of marked and un-marked minefields and mined locations. This can be further exacerbated by the presence of live ordnance, which has been randomly thrown into caves and shafts for disposal, even in areas nowhere near the former military front-line. Following international convention, we retain the use of all toponyms as used in the local vernacular. From time to time and where it is possible in individual cases, we shall provide an in text English Language translation of such toponyms. As in the UK., toponyms often have a distinctive meaning in as many cases as where the meaning has now become obscured by the passage of time. The use of the local spelling of these is retained. Forenames are often international and we will provide an in text translation where possible. BiH "Republika Srpska" Territory. In this latter instance, the Constitution of the "Republika Srpska" political entity distinctly refers to the Serbian Language as having two dialects; namely the "iekavian" dialect and the "ekavian" dialect. More about these different dialects and other sub-dialects can be found via the following Link.."Dialects in BiH"
Where and when appropriate, we shall have due regard for the use of the local alphabet / script. However, where Cyrillic Script is used, we shall always duplicate it using the equivalent extended Latin Script, being mindful of the appropriate changes in language grammar (dialects). It is somewhat ironic that we are unable to determine what laws (if any) currently exist to protect karst, caves and the underground lifeforms. This in a country both where many of its endemic hypogean fauna exist nowhere else in the world and the highly endangered Proteus anguinus has more confirmed habitat locations than anywhere else in the world. It would be true to say that the karst environmental protection situation has remarkably regressed from that which formerly existed under the Austro-Hungarian Administration almost one hundred years ago!! To illustrate this point perfectly, we provide three Links below. The Files which are accessed by clicking on the Links offer three versions of the 1914 Law. Izvadak iz "Glasnika zakona i naredaba za Bosnu i Hercegovinu", od 11 Maja 1914. Komad X. Extract from "Gazette of Laws and Decrees for Bosnia & Herzegovina", from 11 May 1914. Article 10.
for the protection of karst, caves and Hypogean Fauna in BiH. [as bitmap image, 1.91 MB] Link 2. Transliteration of original text from the 1914 Law Document for the protection of karst, caves and Hypogean Fauna in BiH. [as MS Word Doc., 628 kB] Link 3. English Language translation of original text from the 1914 Law Document for the protection of karst, caves and Hypogean Fauna in BiH. 5.0. INDEX OF LINKS TO THE KARSTOGRAPHY OF THE DINARIC KARST IN BOSNIA AND HERCEGOVINA. LINKS WILL GRADUALLY BECOME ACTIVE AND NOT NECESSARILY IN THE ORDER AS PRESENTED. (Links for Eastern Herzegovina will become and then remain active as, when and how agreed with our partners in that Region). There will be more Subject-Links to follow. 1.08. THE KARST AT JAJCE. 1.09. THE KARST IN SARAJEVSKO POLJE. Each of the Linked sub-Sections above has its own Bibliography. However, we will provide a Bibliography below to cover the karst of Bosnia and Herzegovina in more generalised terms. 1. Bock, Hermann. (1913) * "Der karst und seine Gewësser." 2. Gašparović, Dr. Ratimir. (1979).*.. "Doprinos Bosanskohercegovački Speleologa nekim Hidrotehničko-Građevinskim i Naučno Istraživačkim Radovima na Kršu." ..........In : Naš Krš, V. (7)., July 1979. pp. 45-69., SARAJEVO, Bosna i Hercegovina. 3. Milanović, Dr. Petar T. (2006) * "Karst Istočne Hercegovine i Dubrovačkog Priobalja." ..........Published by : Asocijacija speleoloških organizacija Srbije, BEOGRAD, R. Srbija. 4. Mulaomerović, Jasminko; van der Pas, J.P. (1997). * "Tragom jednog poštanskog žiga : K.u.K. Höhlenforscher-Detachment." ..........In : Naš krš, XVII. (30)., pp. 40-42., SARAJEVO, Bosna i Hercegovina. .....1...R. Musil..."Über den Einfluß, den die im dinarischen Karst zu lösenden Aufgaben auf die Ausbildung der Truppe üben." .....2...Conrad v. Hötzendorf. (Hauptmann im k. k. Generalstabskorps / Captain in the General Staff Corps). .........."Einiges über den südherzegowinischen karst in militärischer Hinsicht." .....3...Norbert Spalenh..."Wahrnehmungen und Erfahrungen der k. k. Truppen bei der Okkupation von Bosnien=Herzegowina." .....1...Rudolf Millner..(1917)..."Über die Auswertung von karsthöhlen." 1. Weirather, Josef. (1914). * "Höhlen und Schächte in der Herzegowina und in Montenegro." ..........In : Mitteilungen für Höhlenkunde, 7. (2)., December 1914. pp. 7-8., GRAZ, Österreich. 1. Cvitas, Wilhelm. (1885) "Beschreibung des kesselthales bei Han čadjavica." ..........In : Mitteilungen Section für Höhlenkunde des Oesterreichischen Touristen-Club, 2., 1885. pp. 29-30., WIEN, Österreich. 2. Humitia, J. (1885) "Beschreibung von Schlundflüssen im Rayon der X Militär-Mappi-Rungs - Abtheilung Gelegen, I. Trebinjčica - Fluss. II. Lužarica und Blatina - Bach im Gackopolje." ..........In : Mitteilungen Section für Höhlenkunde des Oesterreichischen Touristen-Club, 2., 1885. pp. 20-21., WIEN, Österreich. 3. Ritter, Franz V. (1884) "Schlundflüss Koljes-rijeka." ..........In : Mitteilungen Section für Höhlenkunde des Oesterreichischen Touristen-Club, 1., 1884. pp. 23-24., WIEN, Österreich. 4. Ritter, Franz V. (1885) "Beschreibung von Schlundflüssen im Rayon der X Militär-Mappi-Rungs - Abtheilung Gelegen, I. Trebinjčica - Fluss. II. Lužarica und Blatina - Bach im Gackopolje." ..........In : Mitteilungen Section für Höhlenkunde des Oesterreichischen Touristen-Club, 2., 1885. pp. 23-24., WIEN, Österreich.